Here’s a traffic and construction alert that is still a little down the road. 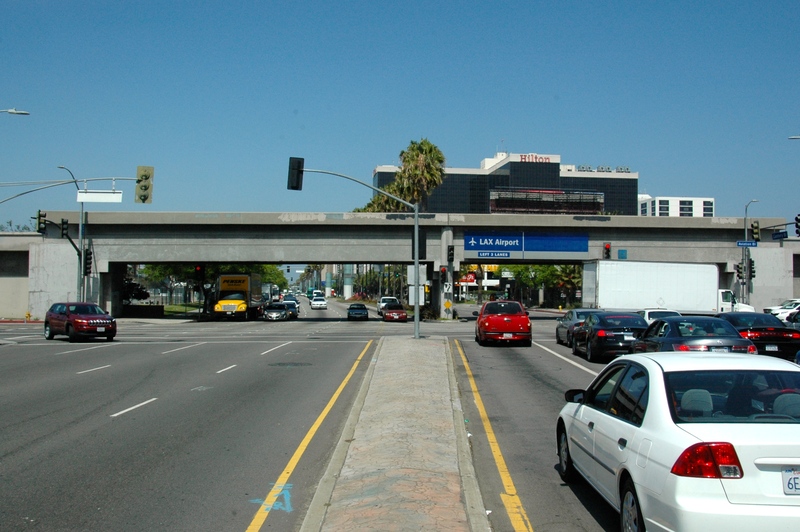 But it’s important, especially for those trying to reach LAX: the old rail bridge over Century Boulevard has to be demolished to make way for the Crenshaw/LAX Line’s Aviation/Century station. The demolition will close Century Boulevard at the intersection of Aviation Boulevard from Friday night, July 25, through Monday morning, July 28. A detour map and alternative routes will be posted as they become available. We wanted to provide ample warning for those who already know they need to travel to or from the LAX terminals that weekend. The company in charge of the demolition project will be Penhall, the same company that demolished the Mulholland Bridge during the Carmaggedon closures on the 405 freeway in 2011 and 2012. The 8.5-mile Crenshaw/LAX Transit Corridor Project is a light-rail line that will run between the Expo and Green Lines. The $2.058-billion Measure R transit project will serve the Crenshaw Corridor, Inglewood, Westchester and the LAX area with eight new stations, a maintenance facility and park and ride lots. For more information on the Crenshaw/LAX Transit Project visit metro.net/crenshaw or by email to crenshawcorridor@metro.net, by phone at (213) 922.2736 or follow the project at facebook.com/crenshawrail or twitter.com/crenshawrail. Looks promising that maybe some people mover or train will finally built in LAX. I just hope it happens in my life time. I hope the station will be nicer and bigger than the rest of the light rail stations. LAX is a major hub for the airlines, the fifth largest airport in the world by passenger volume so they need to make a station that is capable of handling lots of passengers. Building a station with narrow gates without passengers with luggage in mind or narrow dinky platforms like the other light rail stations is not going to cut it. LAX station has to be like a grand one, with a potential for expansion and upgrades, something like a Union Station West. One thing foresure is that there will be more shuttle buses coming to LAX until the people mover is built. Just what LAX needs more shuttle buses. Did this “old” bridge ever carry any traffic? I’m going to sound really old when I say this, but I remember it being rebuilt/upgraded in the 80’s when I was a kid. Not sure whether there actually was rail traffic over this “old bridge” and now it’s being torn down again. Can someone save me the Santa Fe sign?